Champaign, Ill. (September 19, 1976) – It was North versus South on Sunday afternoon at the Champaign Motor Speedway as the first annual United States Dirt Track Championships for late models contested among 45 drivers from 18 states. When the dust had cleared and the last engine shut down, a pair of Georgia speed merchants had put the final victory squarely in ‘ol Dixie’s corner. 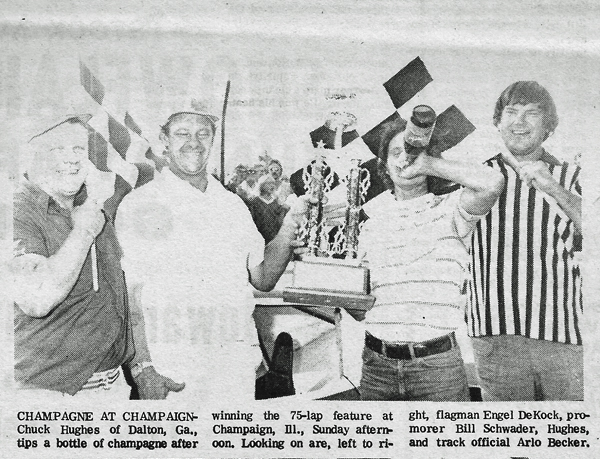 Cigar-smoking Charlie Hughes of Dalton, Ga., dominated the main event from green flag to checker as the 1973 Camaro chauffeur led fellow peach state resident Doug Kenimer across the finish line by a three-second interval. Hughes jumped to the number one starting position, which he earned with the fastest qualifying time during Friday’s time trials. He seemingly pulled away from the rest of the field at will. Four yellow caution periods closed the competition on the rear bumper of the 35-year-old professional race car driver, but each time the green flag waved again, Hughes would quickly open up a five to six second margin. 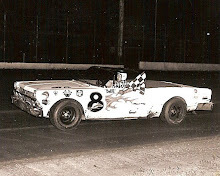 Kenimer, who started fifth, secured the runner-up spot on laps 58 when his 1972 Camaro jockeyed inside of Jim O’Conner of Kankakee, Ill. 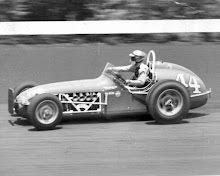 The 16-year, Dahlonega, Ga., veteran was able to close on Hughes when the pair encountered lap traffic but simply could challenge the superior speed of Hughes’ car. Ed Sanger of Waterloo, Iowa, dropped O’Conner to fourth with an inside turn four pass on lap 61 and finished the grind on Kenimer’s bumper. Tom Helfrich of Haubstadt, Ind., edged hi 1973 Camaro around O’Conner’s 1976 Camaro on the white flag lap to take home fourth place money. The victory for Hughes, worth $4,500, was his 35th feature win of the season in the E.D. Ridley-owned racer. Hughes’ credentials entering the race were impressive as were those of the of the other 41 starters. 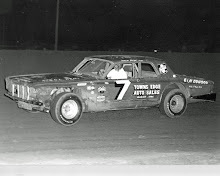 The drivers who qualified for the 75-lap main event had a total of 547 feature victories for the 1976 season. Kenimer’s second place effort netted him $2,300 as the Dixie invaders hauled off with the lion’s share of the $13,500 feature purse. Iowa drivers picked up 10 of the first 20 finishing positions, yet could only place one in the top five. Sanger pocketed show money of $1,500 and Helfrich collected $1,000 for his fourth-place finish. 1. Charlie Hughes, Dalton, Ga.
2. Doug Kenimer, Dahlonega, Ga.
4. 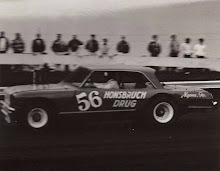 Tom Helfrich, Haubstadt, Ind. 5. Jim O’Conner, Kankakee, Ill.
8. 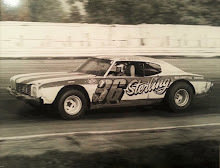 Dave Srock, Ramey, Penn. 12. Bill Teagarden, Covington, Ky.
13. Bob Helm, Andalusia, Ill.
14. Galen Schaefer, Topeka, Kan.
15. Ferris Collier, Lampe, Mo. 18. Ken Phillips, Loudon, Tenn.